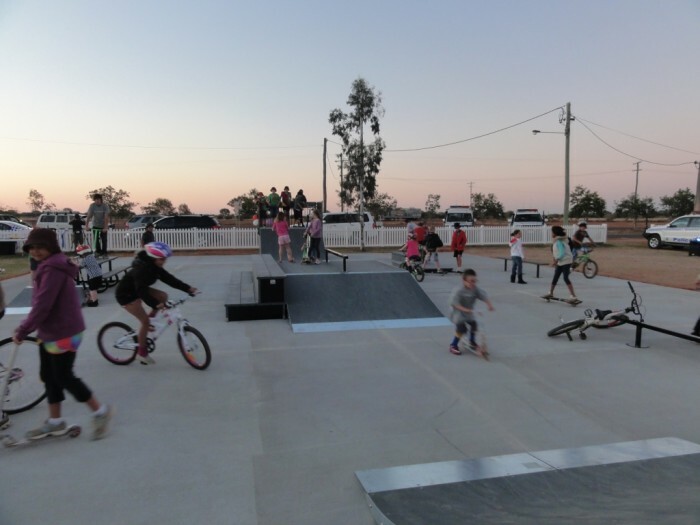 Playscape Creations completed the installation of our first major Skatewave Skate Park at Quilpie in regional QLD. The park’s official opening event was staged with a Blue Light Disco, sausage sizzle and with Mayor David Edwards declaring the park open. DK BMX Bike giveways (co-sponsored with DK and 99 Bikes), T-Shirts, caps and other promotional items helped add to the excitement of the event, but the true value is in the investment that Quilpie Shire Council has made for their Community. Providing a safe place for their youth to practice, build skills and foster a sense of belonging, the Skate Park is a haven for youth riders. Precision engineering, modularity, sustainability, extensive warranty and longevity all contribute to making Skatewave the brand of choice for modular skateparks. Postscript: As at 1.1.18, Playscape Creations is no longer offering Skatewave product in the Australian market due to it no longer being manufactured by Landscape Structures.